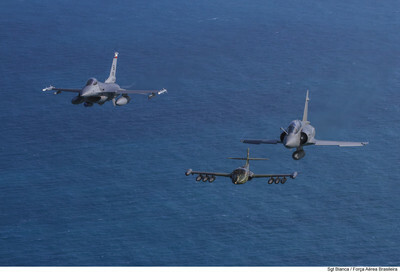 NATAL, Brazil — Brazil kicked off its multinational air combat exercise CRUZEX VII Nov. 18 and invited participation from U.S. and six other partner nations. Guardsmen from the Texas and Washington Air National Guard joined the two-week long exercise and lent support by providing fighter and tanker aircraft as well as personnel from multiple U.S. Air Force job specialties. The exercise fosters cooperation among nation partners while exchanging operational experiences in an effort to promote peace and security when responding to potential events around the world. CRUZEX incorporates simulated air-focused scenarios that prepare partner militaries for air operations aimed at employing missions with complementary objectives involving sweeps, escorts, strikes and air refuels. Ground crews like the Joint Tactical Air Controllers also get to hone their skills as they establish tactics, techniques and procedures with other JTACs from countries like France, Portugal and Brazil. Since promoting strong defense relationships is crucial to addressing challenges to democratic principles, the participants see this exercise as foundational to protecting basic human freedoms across the globe. New York’s National Guard members and service members from Brazil officially became partners in June under the National Guard Bureau’s State Partnership Program, a program that links a state’s National Guard with another country’s military and conducts military-to-military, military-to-civilian and civilian to civilian exchanges. Keegan believes relationship building is the key to promoting quicker disaster response and used the earthquake in Haiti several years ago as just one example. According to Keegan, two primary leaders for that response, a U.S. general and a Brazilian general, had formerly attended a military school together and had become fast friends. The byproduct of that previously established friendship was a more seamless response effort during the crisis. One of the boasting points of CRUZEX is that the air exchange among partner nations increases interoperability, but it also supports military readiness according to Lt. Col. Sarah Johnson, the commander in charge of the 149th Maintenance Group during CRUZEX. Participants also acknowledge the valuable role these collaborative exercises play in relationship building. Military members are able to form new friendships and continue ones long established. One example of this is the camaraderie shared between the Chilean Air Force pilots and the 149th FW pilots. The Chileans are the 149th’s state partners under the Guard’s SPP, and both organizations have taken turns hosting each other for events at their respective bases.